The AVL series provides high amplitude (to ±500V) pulse outputs with rise times as low as 1 ns and fall times of 2 ns, pulse repetition frequencies to 5 kHz and maximum pulse widths variable from 3 to 400 ns. The AVL-AV-1-B provides peak amplitudes of 100 Volts with pulse widths variable from 3 to 100 ns (and to 400 ns with a wide pulse option). The rise time is 1 ns, and the fall time is 2 ns. The -W option offers operation at wider pulse widths (5-400 ns), with 2 ns rise and 5 ns fall times. The maximum repetition rate is 5 kHz. For all models, either output polarity or an optional dual output polarity can be provided. The output polarity of dual-polarity units can be switched from the front panel or by computer command. All instruments with the -B suffix include a complete computer control interface. This provides GPIB and RS-232 computer-control, as well as front panel keypad and adjust knob control of the output pulse parameters. 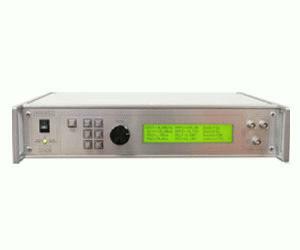 A large backlit LCD displays the output amplitude, polarity, frequency, pulse width, and delay. An Ethernet port for Telnet or Web-based control is optional. All models may be triggered externally using a TTL-level pulse. All models include a delay control and sync output for sampling oscilloscope triggering purposes. A DC offset or bias insertion option is available.